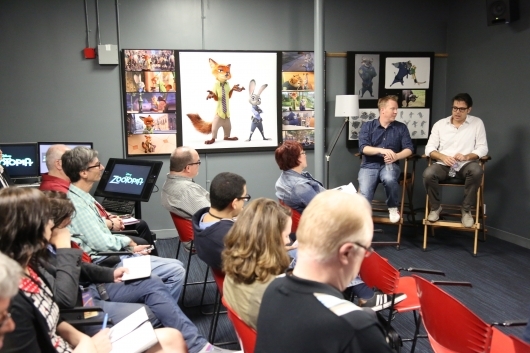 Last fall, a group of journalists were invited to sit down to talk to the creative team behind Disney’s upcoming film Zootopia. The film is an animated play of the buddy cop genre that pairs a naive bunny with a con artist fox. That sort of predator and prey dynamic would really help make the buddy cop feel more fun to watch. We’ve already posted reports on the design and functionality of how Zootopia could exist in real life, and our sit down with directors Rich Moore (Wreck-It Ralph) and Bryon Howard (Bolt, Tangled). But we also got to learn about what goes into a Disney script. Below is our chat with co-director Jared Bush, screenwriter Phil Johnston, story lead Mark Smith, and editor Fabienne Rawley. During out sit down with them we learned about the importance of story boarding, how much a story can evolve before a scene gets animated, and how many iterations of a scene from film can get done before they decide on one. Before we get to our coverage with the writers and editors, here’s a small description of what the team does. As co-director Bush’s responsibility includes trying to figure out how the world works so there is a lot of world building. So this includes research on environments, how animals would interact with each other, making this world believable. Then he goes into characters, what the story will be about, characters’ personalities, etc. Once that is all figured out, they head straight into writing a storyline, and then from there they go onto the script phase. Phil Johnston, who had worked on Wreck-It Ralph with director Rich Moore before Zootopia, co-wrote the script with Bush. For him, he simply thinks of things, and writes them down. According to him, with animation, there are thousands of drafts. “It’s never not finished, until we are told it has to be finished,” said Johnston. Mark Smith, story lead. First pass at the acting, the composition, the lighting, the continuity. Works closely with the writers and directors. Fabienne Rawley is part of the editorial team. They record scratch dialogue. 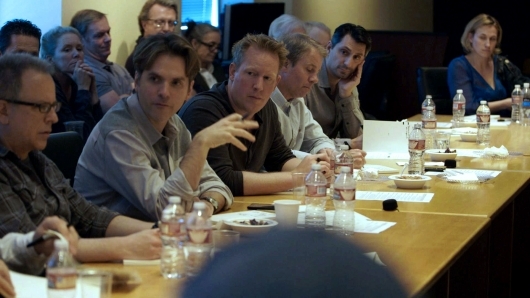 What that is, is that she and her team record their voices first to see what parts of the story works and doesn’t work. This needs to get done really quickly, and they put that to images and sound effects. This process also helps figure out the pacing of the film. The story team as a whole does many many many iterations of the script and scenes. One of the iterations that was worked on multiple times that was shown to us during the long lead was when Judy discovers that her act of kindness was in vain when she sees Nick Wilde sell the jumbo pop that she thought she bought for a little fox child was actually a con to melt down the pops into smaller ones to sell to lemmings and using the sticks to be sold as building material in Little Rodentia. Unable to prove that he did anything wrong, Judy feels defeated. So the scene we were shown is what happens after all of that. Story board artist does these pitches for scenes that will be in the film. To show how these scenes would work, the artists would act the story boards out. Everything from the dialogue, gestures, sad sighs, heavy breathing, right down to sounds like cars pulling up, city noises, phone dialing, microwave’s whirring, and the microwave “done” ring. After they get notes from the storyboard, and agree that it is as good as it is going to get, they send it over to storyboard where they record the scratch actors, then you put the voices to the images add the sound effects, etc. From there it is a matter of figuring out the pacing add music, and adjusting to the scene appropriately. Sometimes just how long a character stands in front of a door before they enter can even change. After this is done, they play a rough version of the scene in front of the directors. The idea is to get it cut as quickly as possible so the directors can see it as fast as possible so that they can give notes to the editing team, and then they can make changes like if there are more boards needed or stage the scene slightly differently. They do this for all the sequences so that the director can have an idea how it works. Ultimately it then gets animated. Basically when a part of the film’s story doesn’t work, it gets reworked, and sometimes new boards are added. There can be a point where there are 20 different versions of a film is iterated before settling on a particular sequence they want. And sometimes the problem isn’t what comes after but what comes before. “So very often, and this happens with all movies, live-action too,” said Rawley. “You just think it’s this, because the thing that isn’t working is what comes after, but really it is what comes before,” she added. Sometimes adding little bits of elements of antagonism like Judy having to impress her parents or noisy neighbors telling her to turn down the sad music will help reinforce the idea of Judy’s day being really bad, which is goal for the scene, which then ends on the audience being left hanging, and wondering how she will recover, which will be answered in the next scene. 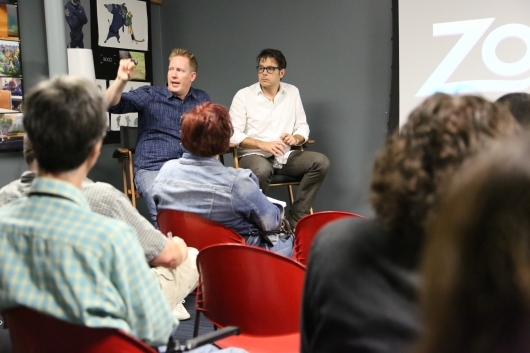 “So much of this is figuring out where we want the audience to be at various points. You have to find it. It’s just not there. It evolves,” said Rawley.